The South Forty Archers was formed in 1984 in Lakeville, MN by a small group of archers who had a passion for the sport of archery and needed a good place to practice. Through years of development, organization, and hard work the club has evolved to its present size of approximately 175 members. South Forty offers a place to practice shooting both paper targets at marked yardages and 3D targets in a woodland setting. The target range features a concrete shooting line, with fixed targets at 20 to 100 yards (90 meters), as well as a standard Olympic 70 meter target. In addition, there are movable targets on wheels, spectator seating, and an elevated shooting platform and sand pit for broadhead practice. The 3D course features quality Rinehart targets of all types and sizes set in a natural environment on a mile long path through the park, with several elevated platforms. Our range is open from around the end of April through October, with several open-to-the-public 3D shoots scheduled throughout the summer. The latest South Forty happenings appears on the News page. 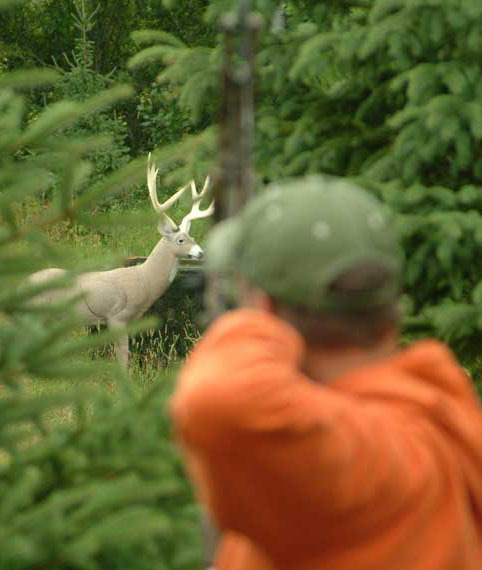 Dust off your bow and come join us in the South Forty Archery Club on the Membership Info and Joining page! All images and content © 2019 South Forty Archers. All Rights Reserved.